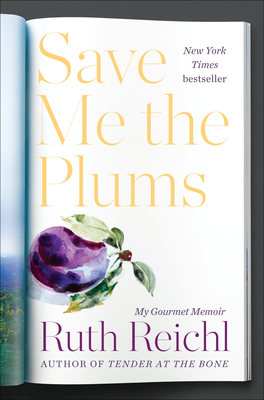 Save Me the Plums ends as Ruth Reichl is about to board a plane for St. Louis, where she had an event with my bookstore. This I knew before I read the book. What I didn't know was the amazing and compulsively readable story of the decade that lead to that point. Ruth's account of her "rags to riches" rise from her California hippy days to the editor of the venerable Gourmet magazine, complete with a Conde Nast wardrobe allowance, driver, luxury office and jet-setting assignments is delicious. But by the end, it's not the personality playhouse of big stakes magazine publishing in its last days that you remember as much as Ruth's impressive genius for all things culinary-the food, the people, the places, the politics. She is a Hall of Famer in the food world and I am in awe of her. What I came a way loving was her immense intellect for food, her wide knowledge of food history, her transparency when she shares how she came of age in the cutthroat world of corporate publishing, her incalculable contributions to the way we think about food, and her deep humanity.